DOMESTIC GODDESSES: When simple pleasures and special treats meet! instead of regular - but the taste is great! Crème caramel is one of my mom's staple special treat desserts. Most things my mom makes from scratch but this is one dish she has always relied on the good old Moir's for. 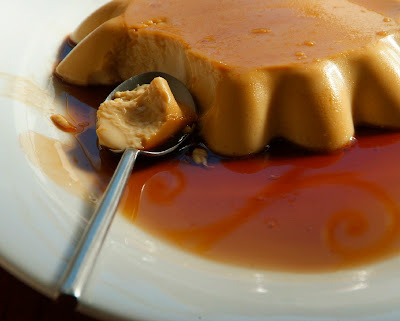 She claims to have tried to make it from scratch many times but has never succeeded in getting it to taste as good as Moir's original crème caramel. I have no problem with this as they do taste really good. However, a few weeks ago, I was paging through a new recipe book lent to me by a friend and came across a recipe which sounded so simple and good I just had to try it. Adam was also getting back from being away and I wanted to surprise him with something special. I did of course tweak it ever so slightly and the end result was sublime. The perfect silky melt in your mouth texture and rich caramel flavour. I added extra salt to the caramel sauce as I'm totally hooked on this new salted caramel trend. I am looking forward to making it again soon for a friend who has always been a crème caramel fiend. PS - the recipe book I found the recipe in is called 'A farm in my heart' and is sublime! A joy to page through and a source for great recipes. Pre heat your oven to 180˚C and place the wrack at the bottom of the oven. Spray 'n cook the mould you want to use. A bread tin or cake tin can be used if you don’t have a specific pudding or jelly mould. Avoid spring form tins as they will leak. Try to use a tin which is the correct size for the amount of liquid as it will unmold better. Find a suitable oven proof container or roasting pan for your bain-marie (water bath) which you will bake the custard in. Heat the caramel sauce ingredients in a sauce pan and stir until the sugar has dissolved. You can add a spoon more water if needed but limit this as the sauce should not be runny. Be cautious not to overcook or burn the sauce is it will turn bitter, so use moderate heat and develop only a light simmer. To check the taste and consistency of the caramel, coat the back of a metal spoon. The caramel should set but not get hard, then taste it to see if it tastes good. Pour 2/3 of the sauce into the bottom of the mould and set it aside to cool. The caramel will carry on cooking in the pot once you remove it from the heat, so work fast to prevent it from burning. Add 2 -3 Tbsp of water to the remaining sauce and stir it to combine. Set it aside for use later. Set a full kettle of water to boil and get your baine-marie ready. For the custard, heat the milk over medium heat on the stove until just before it simmers. While you are waiting for that, whisk together the eggs, sugar, vanilla and salt with an electric beater until pale and smooth. Use a mixing bowl large enough to hold the full custard mixture. Add the milk to the egg mixture and lightly combine with a wire whisk. It should not get foamy. Pour the custard through a sieve over the caramel mixtures. Place the mould into the baine-marie and fill with boiling water about 2/3 up the side of mould. Place this into the oven and bake for about 15 minutes. Keep an eye on the oven as the water shouln't boil. The custard should set but still be a little wobbly. Remove the baine-marie from the oven and allow it to stand for about 30 minutes before removing it from the water. Serve at room temperate or set aside in the fridge until ready for use. To unmold, slide a knife around the sides and invert onto a platter. I usually place the platter on top of the mould and then invert both the mould and platter at the same time, to avoid the dessert slipping out the mount before it has been inverted. Pour the remaining caramel sauce over the dessert and serve.